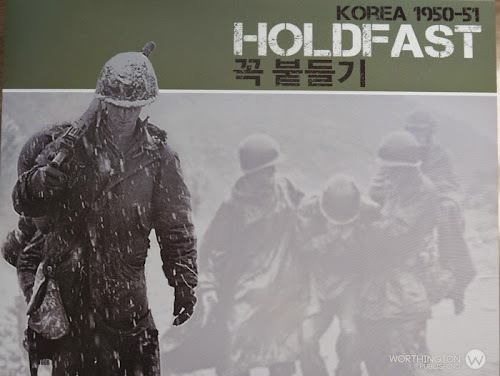 Holdfast Korea by Worthington Publishing is the second title in the Holdfast Campaign Series. The first covered the Russian Front 1941/42 and proved very popular due to its high level of playabilty and simple well-developed rules. The first game worked well and felt like the system had been developed and grown around that particular campaign, which led me to wonder how well it would translate to other campaigns. This post gives a light overview of the system (because the Russian game has already been substantially reviewed here, see the link in the Resource section at the foot of this post) and an AAR with conclusions and observations. Please hit the 'read more' tab for the rest of this post. I was not sure whether to get the Korean game. I had two reservations. The first, as mentioned, was whether the system would transfer to other campaigns to give the same level of success that the Russian game had enjoyed. Secondly I wondered whether the thin neck of land and linear nature of the island might be too limiting in terms of game options. Broadly, I have been able to lay those reservations to rest. My last two sleeved games from WP had excess glue on the sleeve joint, but this one was fine, so it looks like that problem has been sorted. You get a duplicate set of stickers, so anyone who has stickering nightmares will be pleased. The maps are heavy card and come in two linear halves to make a respectable sized map with nice large hexes. During play, I held mine down with plexi, so that will probably show in some of the photographs. side of the 38th Parallel. The only things I thought were missing were (1) a play aid with charts - Worthington often get away with this by having the charts grouped in the rule book and / or repeated on maps etc, but here that is not the case. I printed off a spare set of rules, cut out the charts and made a laminated play aid for our face to face game. At the price of this game, I don't expect to have to do that. (2) there is a rule that the N. Korean player only gets air support on turn one and so since this is just a one turn rule, there isn't a block to remind them of that, as it is assumed the player will remember - I didn't in my first game and it matters. There are spare blocks in the game and spare spaces on the sticker sheet, so one could have been done to help those (me) who might forget the rule :-). (I now use the turn marker as a suitable reminder). Anyone who has played the Russian game will feel fully familiar with this game straight away and for those who haven't, the 5 pages of rules are very friendly - this is a players game. Though a simple game, there is quite a bit of system packed into it and the combination of some chrome (surprisingly not much), the geography of the maps and the capabilities of the units give this a very different feel to the Russian game and the campaign does feel like it broadly follows a historical path (though see my conclusions for some reservations) - clever. The series rules allow a unit to both move and fire in the same turn and it can do each at different points in the game and in whatever order it likes and in that regard the game is very dynamic, but it does raise the problem of how does one track what a unit has done. 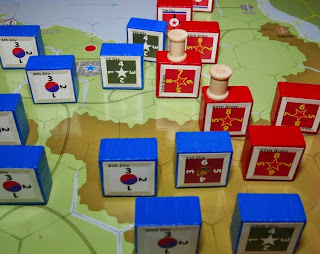 Our solution is that after a unit has moved, it is turned 45 degrees and after a unit attacks, a marker is placed on the block (I use small card makers cotton reels that I also use as markers with my figure games - but just use whatever works for you) So whether a unit is turned, marked or neither, the players can tell at a glance where they are up to. support, plus Resource Point allocation. use those points to perform a variety of actions and these include attack, move, naval assault, transfer between friendly ports, building unit strengths back up and recovering units from the dead pile. As such, each turn is quite dynamic and of course the players might not have the luxury of having enough points to do everything they would like - equally, at times a player will have unspent RP's, but they are lost (no carry over). 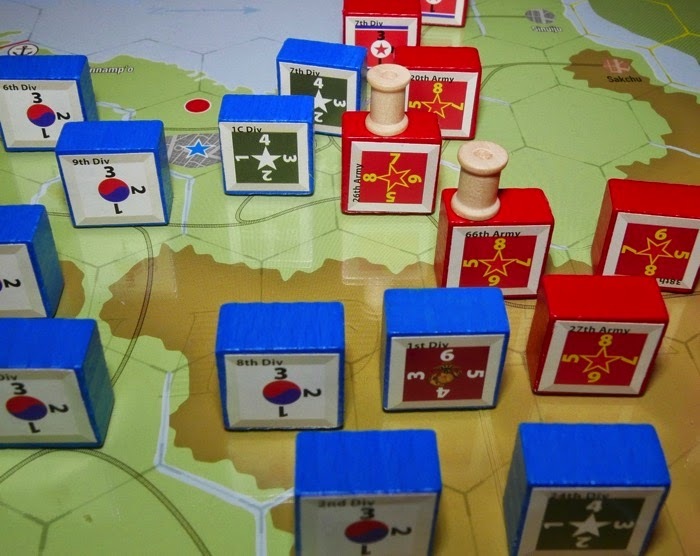 Victory conditions are based on capture of all enemy victory cities (sudden death) or failing that, at the end of the game the player with the most units across the 38th Parallel into enemy territory, wins. This post will now briefly follow the course of a game. Turn 1. 25th June 1950. The Communists get 10 Resource Points (RP's) and the United Nations get 6, though this will increase each turn until the UN reaches a ceiling of 16 RP's. For this turn only, the Communist player gets air support. 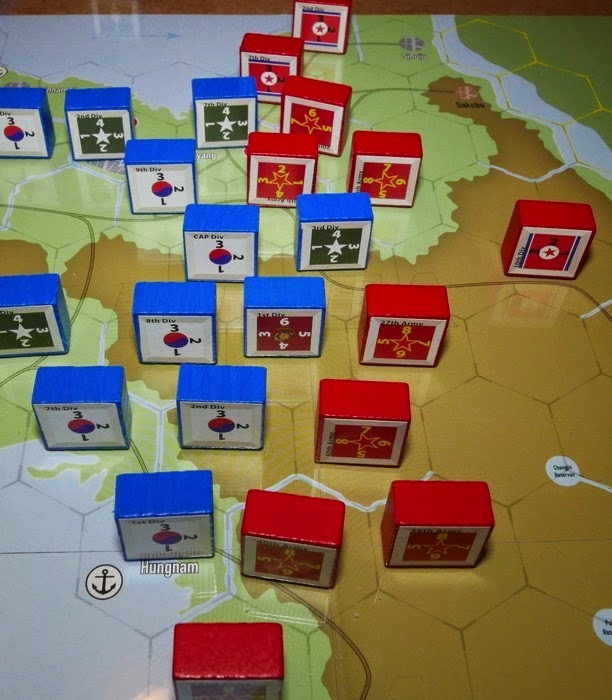 Two of the NKPA (armies of the North) attacks are fails and that is bad news for an opening turn, though by the end of the attacks, the south have lost 3 division. The NKPA 10th Division did manage to infiltrate behind enemy lines, but as the ROK (armies of the South) fell back, it got caught up in attacks and was removed from play. Turn 2. 1st July 1950. ROK RP allowance increases by 2 to 8. They also get Naval and Air Support markers, plus the 24th Infantry Division arrives at strength 1 in the Far East Command Box (an off map box that acts like a UN port). Seoul is still strongly defended and additional replacements (by spending RP's) have built the strength up there to 3 steps. Again, NKPA attacks do not go well and in one instance they suffer 3 losses without inflicting any. Turn 3. 15th July 1950. Both sides now get 10 RP's. The UN have three more 1 step divisions arrive at the Far East Command. The NKPA successfully attack Seoul and remove the defenders, but run out of Resource Points (RP's), so cannot activate a unit to actually occupy the city. In their part of the turn, the US 24th Division is increased by 1 to a 2 step unit (by paying 1 RP) and then it lands at Inchon and advances into the vacant Seoul. Elsewhere the UN pulls back onto their supply lines. The point about control is important. 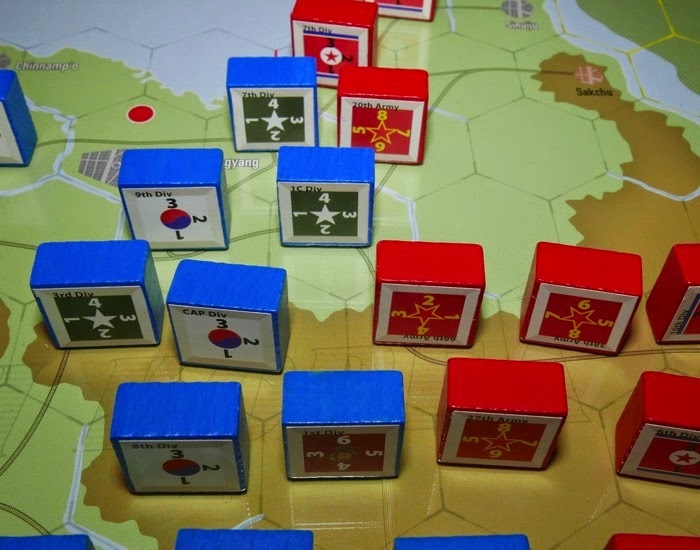 A hex is controlled by the side who last had an 'in supply' unit in that hex. So in this instance, Inchon was in UN control because it started the game like that and Seoul was still in UN control because the NKPA, though they cleared the city in combat, never entered the hex and took control of it. The significance is that the US 24th Division were able to transfer to friendly Inchon (2 RP's) rather than having to naval assault it, which they would if it had been enemy controlled (3 RP's) and transfer also allows movement (already paid for) once landed (Naval assault does not), so the 24th could naval transfer to Inchon and then move to Seoul all in one go (for the two RP's). Turn 4. 1st August 1950. UN RP's increase to 12, they now get more RP's than the NKPA and their armour support allowance arrives. 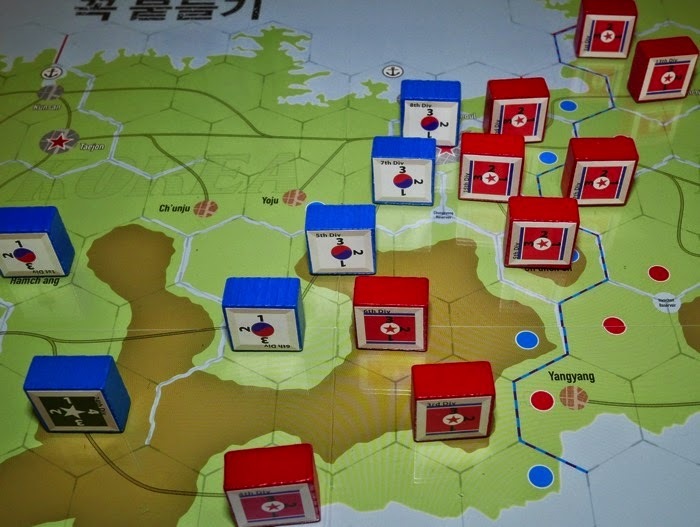 The NKPA capture Inchon and also put a strong attack into Seoul worth 12 D6, resulting in no hits! (needing 5's or 6's), so they are unhappy about that. Their 6th Division then pushes through to make a lone assault on the city and they destroy the defenders, but also themselves in the process. 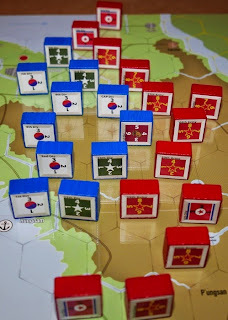 The NKPA only have 1 reserve (1st Division) capable of movement, this takes Seoul, but the concentration of units at the city has left their left flank rather weak. The UN build up 25th Division, located at the Far East Command Box (off map) to full strength (4 steps) and make a naval assault at Inchon, supported by naval and armour assets. They capture the port and that will be enough to cause the NPKA a serious distraction in the next turn, as they will have to deal with that threat rather than just push on. (Please note that some of these finer rules are in the example of play on the rear page rather than in the body of rules). Turn 5. 15th August 1950. UN RP's increase to 14 and their US 3rd Division arrives at strength 1. 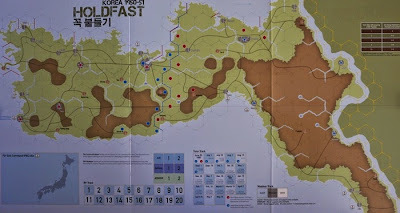 The NKPA retake Inchon, but it is incredibly costly, they lose 6 steps in the attack and can't actually occupy the port without stripping away essential units from other sectors. The US 3rd Division land back at Inchon. Other units build up their strengths. The front has stabilised and the immediate threat of actually losing South Korea has now passed. The NPKA have had some terrible luck, both in bad dice rolls and running out of RP's, leaving them unable to take the ground that has been fought for and this has influenced the entire opening of the game. troops back in without a fight. Turn 6. 1st September 1950. The UN RP's have now increased to 16 (their maximum). Also the 1st Marine Division and US 7th Division arrive at the Far East Command and importantly they both arrive at full strength. The Marines are a 6 step unit (represented with 2 blocks). The question is whether the UN should gamble now and go for a landing deep in the enemy rear to cut the NKPA's supply. It is gamble because overall the UN have not brought their army up to full strength and once they cross the 38th Parallel, then the North start rolling for powerful Chinese forces to intervene. They decide to go for it. The Marines assault Wonsan. They are unopposed and capture the port, allowing the 7th Division to immediately follow by naval transfer and strike out east towards P'yongyang. This move cuts all supply to all the NKPA south of that position (i.e. all 8 units in the photo below). See the Marines and 7th Division located far right. Turn 7. 15th September. The Communists fail their roll for Chinese intervention. The NKPA divide their army in two. One half remains in place to pin UN forces, while the other half attempts to infiltrate back into the deep north to escape the supply blockade. US 7th Division enters P'yongyang and 1st Cavalry Division land and move through the marines to strengthen the blockading forces. The UN also recapture Seoul. this turn, so will lose a strength step each for being out of supply. Turn 8. 1st October 1950. The roll for Chinese Intervention fails. The weather is overcast, so the UN lose their air support. The NKPA lose three units through supply problems and the UN make big gains. The ROK 3rd Division naval assault just beyond Wonsan at Hungnam. Turn 9. October 15th. The roll for Chinese Intervention fails. The weather returns to clear. The UN push on north. The NKPA are reduced to just four units, each at only strength 1. Turn 10. November 1st. The roll for Chinese Intervention fails. The weather stays clear. The UN make another landing further up the coast, this time at Ch'ongjin (bottom right in the below photo). They occupy and take control of more of the North's cities and villages, making it harder for the NKPA to bring replacement units back into the game. The UN are pushing ahead quickly before any Chinese intervention. Turn 11. November 15th. Chinese forces intervene. This immediately raises the NPKA Resource Points from 10 to 15 for the rest of the game. The first snow arrives. The UN have come close to instant victory as they hold all but two VP cities on the map. Turn 12. December 1st. Weather is clear, the UN air cover returns. 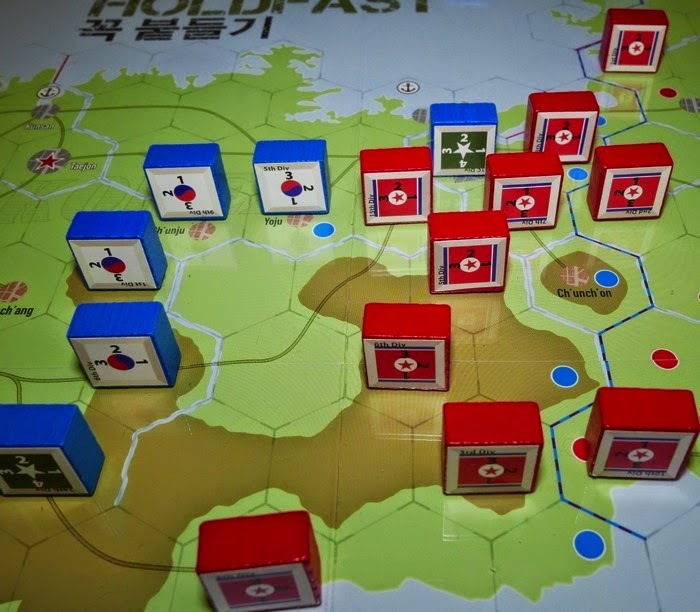 Both sides trade shots while they try to get their fronts properly organised. Turn 13. December 15th. Overcast. The Chinese forces inflict heavy losses on the UN, but the lines barely move. The UN cannot respond as they spend most of their RP's for this turn just build their strength back up. Turn 14. January 1st. Clear weather. The North take heavy casualties and their assault has ground down to a halt. The game is becoming a stalemate. Turn 15. January 15th. Snow returns. For all their efforts, the North gain just one hex this turn. Turn 16. February 1st. Overcast, so no UN air support. The situation feels like a grinding action between two large bodies. The North take the greater casualties. Turn 17. February 15th. Snow again. The UN stand firm. Turn 18. March 1st. Snow. The UN have had to pull back in a couple of places to re-dress their lines and again the North suffer high casualties. 1st Marine Division, it costs 3 RP's to rebuild each lost step. Turn 19. March 15th. Overcast. The situation is settling down into a stalemate. Turn 20. April 1st. Clear weather. Stalemate. Turn 21. April 15th. Clear weather. Both sides put in strong attacks, but each has enough RP's each turn to recover most of their casualties. Suddenly the Reds manage to create the first breakthrough opportunity in months. But in their half of the turn, the UN close that down and create their own crisis for the North, this shows how quickly things can move once manoeuvre opportunity exists. Turn 22. May 1st. Automatically clear. Stalemate returns. Turn 23. May 15th. Automatically Clear. Both sides make their last futile attempts at degrading the other, trying to retain positional advantage, but the situation has become one of gridlock. The game is a UN victory. If neither side wins a sudden death victory during play (capture of all VP cities), then it goes to the player that has the most of their units on the enemy side of the 38th Parallel at the game's end and this is clearly the UN. Conclusions: This has been my fourth playing of the game. 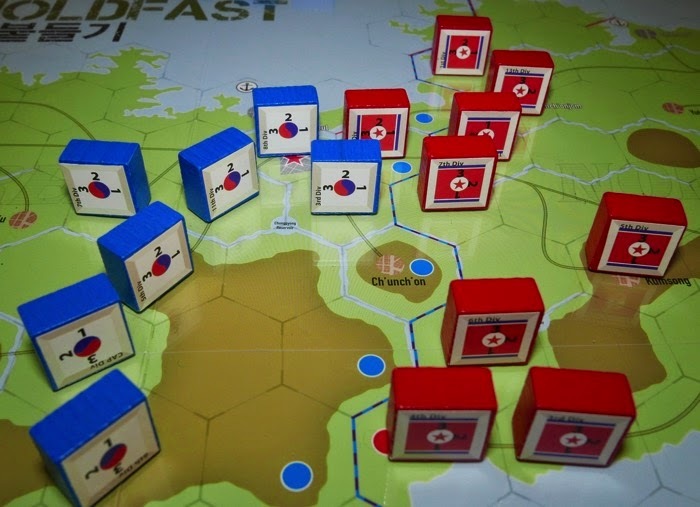 In our first game I made the drastic mistake of allowing units to roll dice equal to their block strength. The Chinese army with their 8 strength units became an unstoppable steam-roller. We had been playing a Columbia block game the week before and unfortunately I allowed that to influence our game - so even 5 pages of rules needs to be read carefully. There is a lot of subtlety in the game and a player needs to play a few games to explore them. 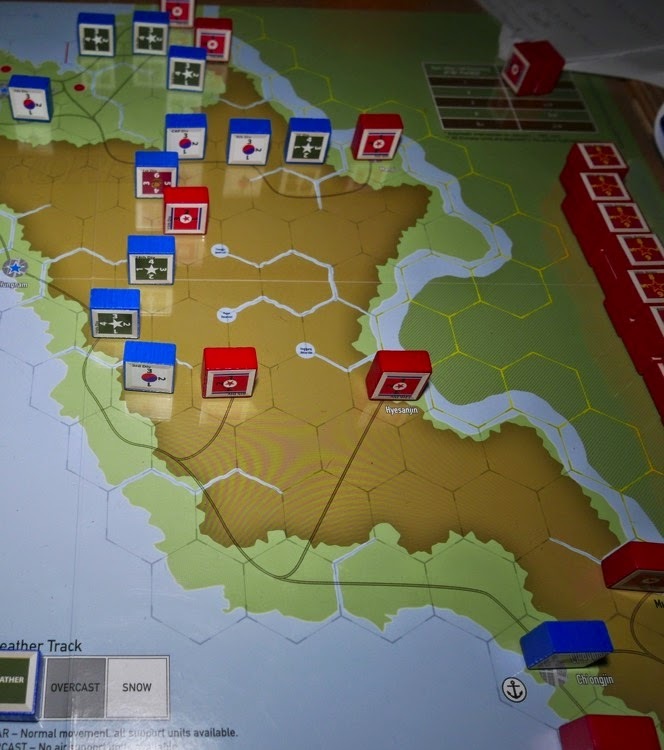 For example, the threat of naval invasion against a port is a very real danger for the NKPA player and there is a temptation to occupy some ports to defend them, but naval assaults can be devastatingly effective and they play in multiple rounds of combat until one side is removed and this will most usually be the NKPA player. 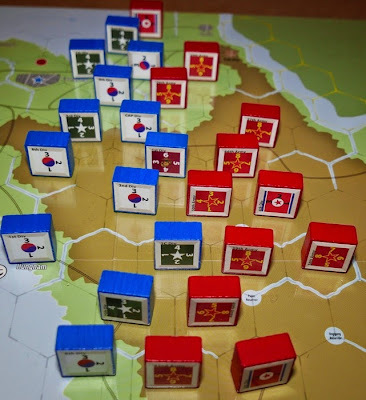 It can therefore sometimes make better sense to defend the hex behind the port, so that when the invader captures the port, they can't just transfer another unit into the port to move and strike deep into undefended northern territory in the same turn. 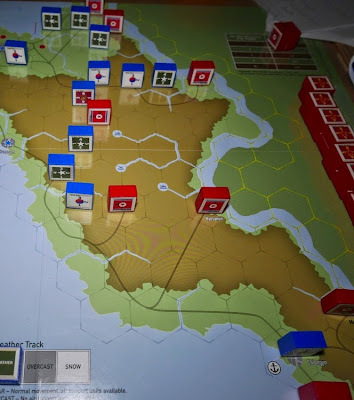 The map and weather conditions also give nuances in tactical situations. For example, Units have a basic movement allowance of 6 MP's. It costs 3 MP's to enter an enemy Zone of Control. So on many occasions a unit can move into a ZOC and then immediately move into another ZOC and this will exhaust their movement allowance. But, in snow, movement allowances drop by 1 MP and in any weather crossing a river always costs 1 MP and so in both those situations, a units movement potential would in effect be 5 MP's, which would not be enough to allow it to enter the second ZOC - a subtle effect but when it happens it is usually important. It is a beauty of a rule (only to one of the players though :-) ). So the system has managed to move period and theatre and feel very different than the Russian game. It does also generally manage to reflect the history of the game, but for me, some of that important history has happened in the wrong place, which has essentially given victory to the UN. There are two issues. Firstly, do we get the initial massive NPKA advance that gets us pushing the UN down towards Pusan? Well I know others have, but this has eluded me on each occasion and this is mainly down to the luck of the dice. As you will have noticed, in one of my attacks, I rolled 12 dice and didn't get a single hit - unusual, but the opening can be open to such variables. The NKPA player has to play very thoughtfully in the opening turn. Knowing when to use air and armour support and when to use RP's to drag a used unit out of the line and put a fresh one in to make a second attack is important. Actually, I don't mind this part of the game being tough to drive south, because it is a tense and exciting part of the game for both players and produces a good emotional connection to the game. EDIT - in my 5th game, the NKPA did very well and threatened the south. The second issue has caused me the greatest problem. Once the Chinese armies are released, I don't seem to get that historical UN 'bug-out' situation, rather both sides have enough resource points to be able to lock horns, launch big attacks and then be able to make good the losses by spending RP's in the next round and so it seems that once the Chinese join the battle, the bug-out doesn't happen and play goes straight to stalemate with most of the end game just feeling like a banging together of heads. Now the historical situation did end up in this stalemate and the peace was brokered around that, so the effect of stalemate is well represented (probably by some fine tuning during play testing of those 15 RP's), but the stalemate happened around the 38th Parallel, following the bug-out. In each of my games, the Chinese intervention has always made contact with the UN while the UN are deep in northern territory and the game has immediately gone to stalemate at that point. As such, the North have never been able to battle back down to the 38th Parallel, with the result that they have always lost. 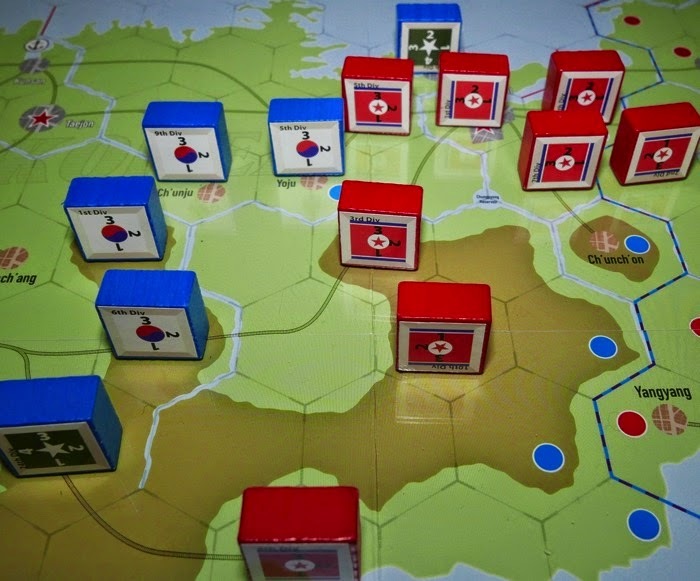 I have read another gamers account on BGG that seems to give an exciting finale at the 38th Parallel with a fairly tight result, so I don't know whether I am missing a trick, but it feels like when the music stops (the Chinese first clash), that is were the battle-lines will be drawn ...... and stay drawn. I played the 4 games to look for some variations on this, but I didn't get them. I supose if I got a better early NKPA outcome and an early Chinese intervention roll, I might see something different. I am wondering whether a house rule would help me. Something along the lines of 'Once the Chinese make their first attack, that turn and the following turn, all Chinese (only) units attack at double strength (i.e. 6 D6 instead of 3)'. This would certainly create the 'bug-out' effect and get the battle nearer to the 38th Parallel. It would also be in the interests of the UN to make sure that this contact takes place as far north as possible. 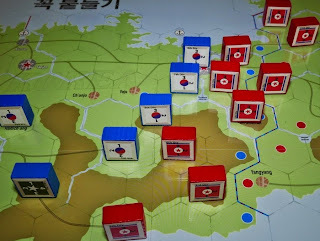 This might need tweaking to say 6 dice in turn one and then 5 in turn two and even introducing 4 dice in turn three, after which time attack capacity returns to the normal 3 D6, reflecting the Chinese offensive running out of strength. Anyway, it seems an insertion of a similar rule at this point in the game would have helped my games. Otherwise the long stalemate feel a bit tedious for both of us - especially as the outcome (a UN victory) becomes almost assured from the moment the Chinese engage the front line on Northern soil. Making the game actually end in such an effective stalemate work has been cleverly crafted - it's just that in my games, this happens before the Chinese can push the UN back. That aside, I like the game, it is attractive and moves along at a good speed. The situation always gives both players something to do and each hex feels like it matters. This is a players game that offers something different from the Russian sister game. Simple games that work are not easily made, there is some clever abstraction going on here that works well for a game at this level. Presently there is not a lot being written about the game and as such I do not really have anything to base by experiences against as to how I might be able to play the game a bit closer to the designers intentions, as I doubt their play test games could have ended so far north. I have put a question up at BGG that will hopefully get me there. EDIT - Since writing the above, I have played a further game (5th) face to face. In relation to what has already been said, the notable points were that initially the NKPA got as far as Taejon and could have taken Taegu, this part of the game was really fun and tense. By turn 4, the NKPA had lost the initiative and were responding to the the UN instead. On the 8th turn (1st October) the UN crossed the 38th Parallel. They drove deep and were just one hex away from total victory (sudden death) when the North got the Chinese Intervention on Turn 10 (October 15th). By turn 13 (December 15th) the lines had solidified on an axis from Namch'onjom to Wonsan and pretty much for the rest of the game this is where the line sat. We just played by the standard rules and did not give the Chinese any extra house rule benefits, because on their turn of release, the UN were scattered all over the place, with the bulk of their army trailing all the way back to Seoul. So again we found the game went to stalemate as soon as the two forces solidified their lines. We have decided that we do need some sort of house rule for the next game. "On the Chinese coming in. Try attacking one UN unit with 3 Chinese, eliminate the UN unit. Remember units can move through friendly units, so move a fresh unit through into the hole created and attack. You can create great holes that way and drive the UN units south. Its a great strategy, the Chinese units can lose some SP so you don't have to spend RP to replace SP and can keep the attack going for a while that way as you drive the UN units south. FURTHER EDIT CONTINUED - I have played a 6th game to more rigorously prosecute Grant's suggestions. The Reds did make some minor progress, but it was all just a hex at a time type of stuff, one Chinese army did reach the 38th Parallel, but everything unravelled in the last couple of turns and the UN pushed into the Chinese lines. They landed at Chinnamp'o (a port near Pyongyang) and stressed the Red's supply line. By the end of play, there were 4 full Chinese armies removed from the map and of the 5 remaining, 4 were at 4 SP's or less. 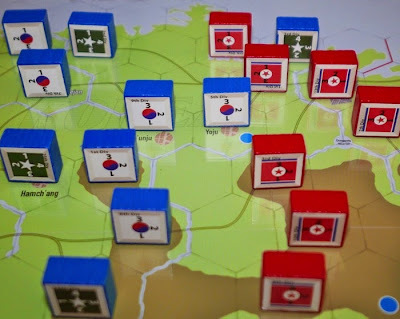 They had one unit at the 38th Parallel but not across it, while the UN had 7 units over the border, with most being 2 or 3 hexes deep into enemy territory. So another UN win. Complexity: The box says 3 out of 10, which seems pretty much spot on. There are around 5 pages of rules, though there are some interesting things going on in there, so make a few notes for the first playing. In my first game, I made the stupid mistake of having the number of combat dice equalling the current block strength and also forgot to the give the NKPA air support in the first turn. So paying attention to the slim rules is important. Also some rule elements are actually embedded in the examples of play - so read those. Overall the rules are clean and easy to locate. Time: The box says 3 hours, that seems about right for a comfortable session, faster players or solitaire play can shave half an hour off that. Solitaire: This is a two player game, but it plays fine solitaire (this is stated on the rear of the game box). The Resource points can limit what a player can do, so the solitaire player is often doing the 'obvious' things that a side needs to do anyway. Face to face does give fog of war in which enemy strengths can be concealed - but in the world of solitaire play, players will be happy with how this plays. Size: The map is just under the standard size of what we might term 'a full sized' map and there are no 'off board' play aids, so this game will fit onto a kitchen table and mine is presently on a large pinboard, so that I can move it around if needed. As always Norm a great review. I own HF Russia an am temped by this game. The components are fine but for the price I would expect better. (mounted board, player aids and more dice). Agree with your comment about the stalemate coming too fast and too far north. I think the real underlying issue is provided a unit is in supply then the logistic costs stay the same across the map (so refitting a UN unit across the 38th is just as easy as adjacent to Pusan), but a boost to Chinese attacks for surprise is likely a 'gentler' fix. Declan / Peter, thanks for posting. I really enjoyed the Russian game and was pleased to see how the same system could produce quite a different game for Korea. The stalemate has been a problem for me, but it seems that house rules will be able to address it, though the fix itself would need to be tested over a number of games to get things to end up on or near the 38th Parallel. I am glad that you posted having similar experiences, as I have really been scratching around trying to see if I have been missing a tactic that would help get the battle nearer to the 38th, hence the reason why I played 5 games before posting. Refitting costs would be an interesting area to look at, though the 8 step Chinese units could sustain more turns of simply not re-fitting, so there would be an extra dynamic to consider there. I would love to see a play testers AAR, accepting that the variables of how well the NKPA do in the first 3 turns and how early the Chinese intervene will influence the outcome. In the end part of the game, I find the Reds are very nervous of UN landings in their rear areas and the UN can launch them as spoilers against a North player that was making progress - not sure whether there needs to be a cap on that, or whether that sort of potential was militarily justified. Ran across your review while trying to find opinions on this game. I have had the exact same results and it seems impossible for the game to be a competitive experience. 1- being able to buy multiple steps in EZOC makes suicide attacking and low percentage attacks normal. There is no fear in not having enough steps to defend borders. 3- Navel invasions into North Korea is unblanced, being able to invade and then teansfer through the same port on the same turn is just silly. 4-Double movement is too powerful, SR should be done like in Russia. I like HF Russia, even though it is a bit imbalanced it is still fun, Korea in my opinion is unplayable and a serious dissapointment. To me it seems this game wasnt tested at all and the lack of activity on the BGG forums is telling. Roger, thanks for posting - it really helps me to be more sure that I wasn't missing a trick. Like you, I am a fan of the Russian front game. I don't know enough about the Korean campaign to actually comment, but I did wonder whether the UN really had the beach assault capacity that is available in the game (i.e. each turn). I'm hoping BGG gets a few more entries showing player experiences. How do you suggest fixing supply? That seems the mote interesting fix. What factors make supply across the parallel harder? Hi, I decided not to invest time looking for fixes as I thought it would take too many play tests to ensure the balance was right. I sold my copy some time ago, so am no longer familiar enough with the system and situation to offer much help - sorry.